(20-06-2015 02:57 PM)simspeaker4 Wrote: Not sure if this is the right place to ask but anyway; I'm looking to spend some money on Best Buy. I don't have TS3: Uni so I was thinking of getting it. I have ITF and a few other things installed that came after Uni - do I need to uninstall that bunch so Uni is installed in order or can I say heck with it and install it as it is? I didn't know if this should go in technical so here you go. Thanks and have a great day. You should just be able to install Uni without having to uninstall anything else. You might get one of those messages about the game being more up to date than the expansion pack is expecting (I love it when inanimate objects act all surprised!) but it shouldn't prevent you from going ahead with the installation. But then, this is EA code that we are talking about, so really anything is possible. If it helps, I bought Generations very late but had no problem installing it on top of everything else. My Sim family (made in CAS) in Lunar Lakes just got fined $500 (sorry don't know where the simoleon symbol is) for "falsely reporting an emergency" after the firefighters took FOREVER to come during a stove fire. The husband has the Brave trait and put out the fire before they arrived! It's not their fault you guys took forever to come! Ha! Yes, that happens to my sims as well. All the freaking time! Here is something I found today that doesn't make sense. 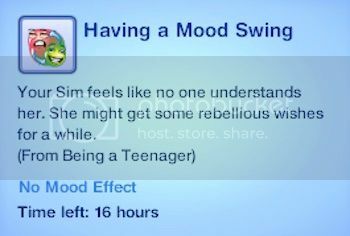 "Having a mood swing" ....... "no mood effect". This person just walked out of the cinema, dressed up in cardboard boxes! That's a new one for me. That Sim has the "Bot Fan" Trait. Does that Simbot work for Legal & General, Caspin? Hi Minty. It's been a long time since I've been anywhere really. Had to get over the sadness of what EA has done to my game. I of course gave my Sim the Bot Fan trait when ITF came out and was not impressed when I discovered that the Bot costume was his outfit of choice all the time. I took that trait away real fast. So sims can't be fans of bots unless they are willing to walk around dressed in boxes most of the time? Great! I've seen that sim all over town since that first sighting, always carrying their L&G brolly. I haven't messed around much with ITF, apart from a quick exploration when it first came out. I should look at it again, although mostly I prefer a realistic-ish game. Always good to see you Caspin. I was embarrassed for my Sim when he put the outfit on in front of all the other sims.